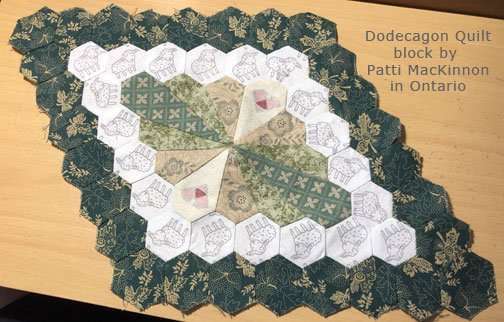 More Inklingo quilters have solved the Case of the Secret Garden Mystery and when they are not quilting, they are writing patterns, blogs, and poetry! Sue’s color choices work perfectly, don’t they? It is beautifully done and that narrow accent border is brilliant. Sue’s is the only COTSG with borders so far. Sue has also started sewing Inklingo Apple Core, so she is getting lots of experience with curved piecing! She is printing the Apple Core shapes on Jelly Rolls (2.5 inch strips). Ruth is the creative mind at Sewlmate Sister and an experienced Inklingoist. 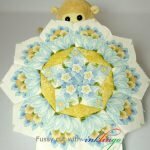 Her blog is fun and if you have been following it, you have seen her spectacular Inklingo Clamshell Pickle Quilt too. 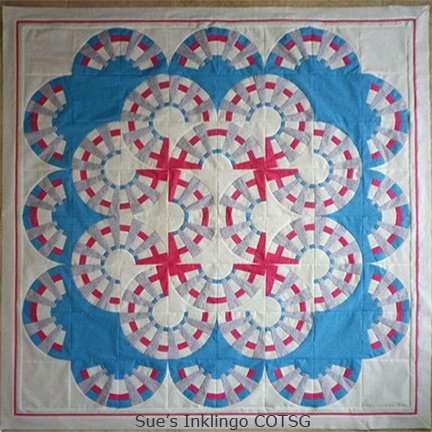 Ruth is also active on Facebook with Inklingo Quilts and Projects by Regular Quilters. Cathi’s first love is hand piecing, but the COTSG mystery convinced her to try rotary cutting curves and chain piecing by machine. Cathi has been a dear friend since early Quilted Diamonds in 2002. She and Baxter blog almost every day at Quilt Obsession. You don’t want to miss her patterns and lessons! She has been an Inklingo quilter from the very beginning—almost seven years now! 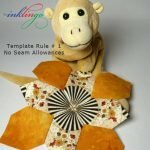 Cathi was one of the first quilters to write patterns for Inklingo, and her first two are free. 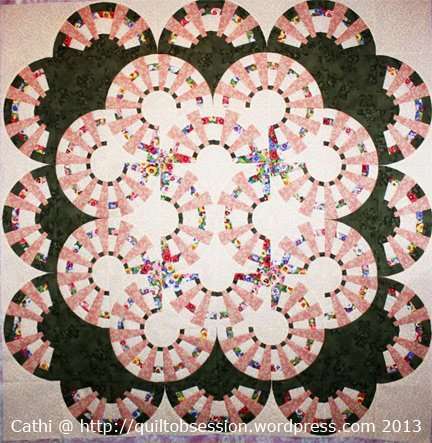 Cathi’s Tumbler Stars and Emma’s Butterfly Stars have been downloaded by thousands of quilters. 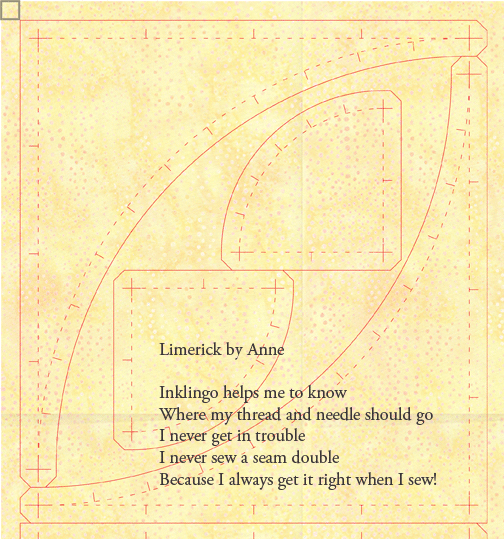 Cathi has also written Inklingo patterns which she sells on her website. I could go on and on about all the ways that Cathi has inspired me, but I think if you visit her blog, you will understand instantly. Kathy is another longtime friend, The Dragonfly Lady, and an expert with fussy cutting. 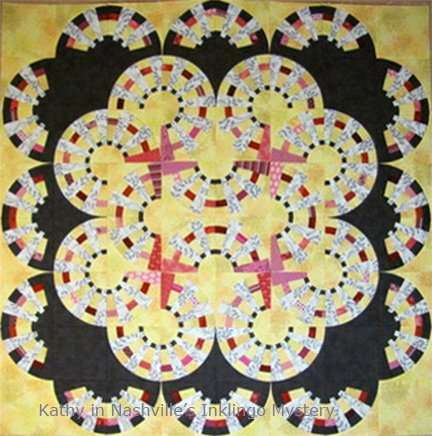 I met Kathy in person many years ago when I was teaching in Washington State and I saw all of her Quilted Diamonds blocks, front and back. It was a thrill to me. 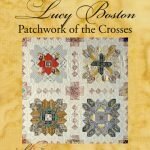 Her hand piecing is flawless and her fussy cutting is brilliant. Kathy looks at fabric in a different way from the rest of us mere mortals. She also gives me stash envy. All of her quilts are exceptional and one of her Inklingo quilts was juried into the AQS show at Paducah a few years ago. 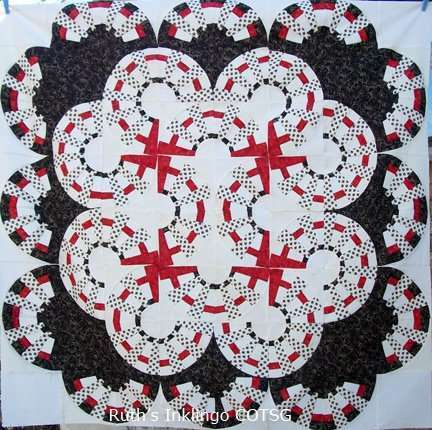 We have already shown you Mary’s gorgeous red COTSG quilt top and a few other beauties. If you have a picture of your COTSG quilt top, please let me know if I may show it on the blog. 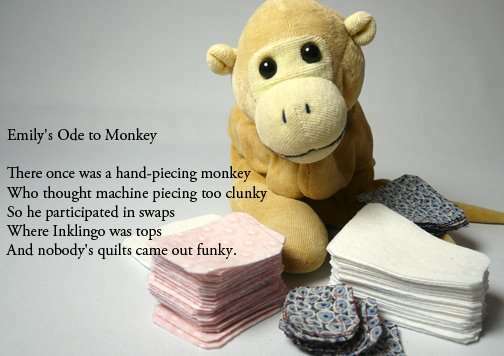 So far, we think this is her only poem, but she has been printing shapes on fabric with Inklingo since 2009. Thank you, Anne! We love it! Anneke is a quadruple threat: She writes patterns, she blogs, she writes poems, and she is an expert at designing with Electric Quilt. I hope you follow Anneke’s blog too. She is a close friend, despite the fact that we live so far apart. If you are ever looking for inspiration in EQ, Stof Genoeg is a great place to go. She designs with Inklingo shapes and created a Dresden Plate Pattern for EQ Boutique. Anneke writes her blog in Dutch AND in English, and she has translated the first chapter of The Inklingo Handbook into Dutch. Emily is The Caffeinated Quilter. She is a talented designer and sells patterns on Craftsy. Now we know she writes poems too! Emily loves hexagons, but not English Paper Piecing. There is a Hexagon event on her blog next week. Make sure you get your hexie projects ready for Show and Tell at Quilting Gallery. Emily is sponsoring prizes. Now that you have seen so many COTSG quilts, it isn’t a mystery anymore, but it is not too late to start. It is perfect for Inklingo beginners. There is not any suspense about whether your blocks will fit together because the cutting and sewing lines are printed on the fabric! 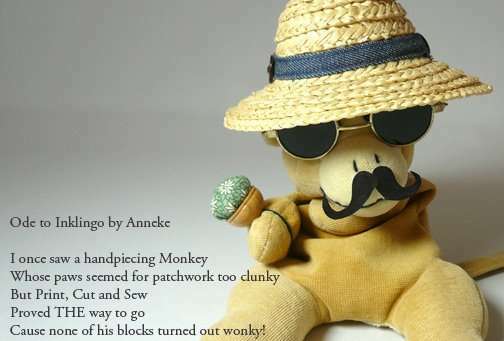 Facebook doesn’t seem to be very popular with Inklingo quilters even though we are all online. Monkey has never been able to get his mind around it, but we are getting close to 1000 “Likes” on the Inklingo Facebook page. Can you help push us over the top? 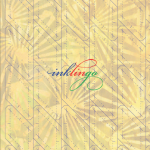 Inklingo Quiz – Just for Fun! 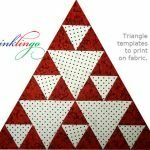 Inklingo Equilateral Triangles for Pyramid Quilts! New Periwinkle Octagon Shape Collection and Lessons! I am enjoying the show and tell! So much fun! Thanks for a great mystery Linda! I am strongly considering putting an accent border on my version; I really love Sue’s! These are all turning out so beautifully, and pretty too. Ah, Monkey, what else do you have in your closet of disguises?